The Old Foodie: Readers Choice. Something to do with rapunzel, scozonera and skirret please. Love your blog! You've taught me a lot. Thanks! How about a colonial america piece? 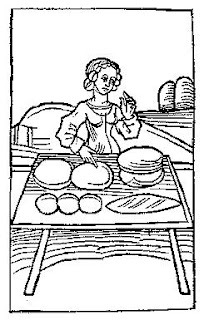 As you are heading to Oxford, it would be nice to hear something about Oxford - cookery both historic and current, home and restaurant. Both how they eat it, what they eat, and how they talk about (excuse me I mean hold discourse upon) food. Oxford theologians have always made a rather important noise, haven't they? Were there any famous among them for their dining habits? What the dons (is that word even used anymore?!) get to dine upon as opposed to the struggling students in the various dining halls . . .
Ah! Pubs in Oxford! (with histories, of course, and generous tastings of the drafts with descriptions of flavor). A history of the Symposium itself would even be fun, with menus attached. Well then. If I have more ideas, I'll write in later. Hah! I just re-read what you wrote and saw that you intended to use the first fifteen ideas. My goodness I sounded selfish in posting six ideas in a row. Trying to hog the airwaves, I am. I promise to try to stifle myself. Gosh what an exciting symposium. I checked out their site and I think this years subject is very timely. I'm looking forward to hearing all about it when I visit. karen - I will definitely pick at least one of your ideas, in fact I think I already know which one. Dont hold back on your greedy ideas - they are all great. pootentate - your suggestion is in. barbara - we will talk about it over a good champagne. I will look forward to it. Only one more idea came to mind and it might be too complex: British mystery novelists have often had their protagonists wandering through Oxford. I wonder if any of these famous fictional detectives ever dined there and if so, what they ate. Not as deep as comparative theology, perhaps. What would this be called, comparative fictional eating habits? Ha, ha. Hello Karen - I think I will have to allocate a whole month to your ideas. I know that there is quite a food tradition amongst the Sherlock Holmes afficionados in London, but I dont know who to associate with Oxford - so there is a project already.